Capital of an arrondissement in the department of the Var, France. Like most of the principal cities of Provence, Toulon contained a Jewish community in medieval times; and under the counts of Provence the Jews of the city fared like those of many other communities, being sometimes oppressed and sometimes treated with kindness. When the Black Death raged throughout France in 1348, the Jews of Toulon were accused of having poisoned the neighboring springs and wells, and forty were killed in a single night. Noteworthy among the scholars of the city were: Berechiah ben Azariah of or (Rabbinovicz, "Diḳduḳe Soferim," xi. 17), to whom belonged the Codex Vat. 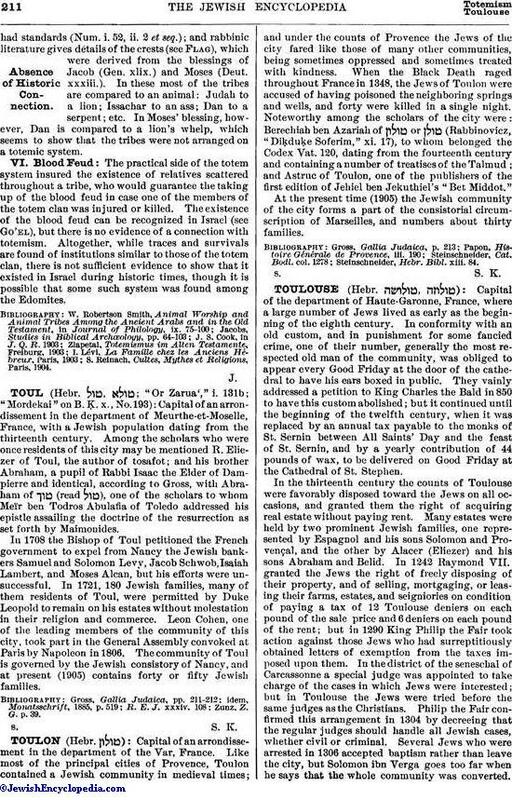 120, dating from the fourteenth century and containing a number of treatises of the Talmud; and Astrue of Toulon, one of the publishers of the first edition of Jehiel ben Jekuthiel's "Bet Middot." At the present time (1905) the Jewish community of the city forms a part of the consistorial circumscription of Marseilles, and numbers about thirty families. Steinschneider, Hebr. Bibl. xiii. 84.